What To Do With Hendo? The Charlotte Hornets made a major splash during July’s free agency sweepstakes, inking rising star Lance Stephenson to a three year, $27 million contract. Although there was a bit of drama leading up to the particulars (“who” and “how much“), the decision itself wasn’t a surprise. 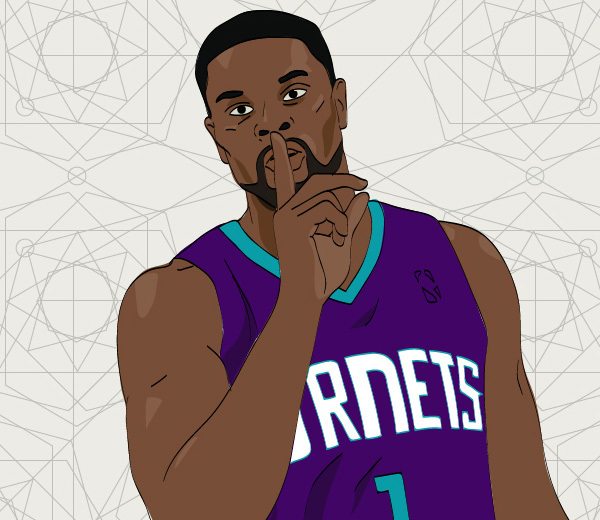 An upgrade at one of the wing positions had been anticipated since mid-season, when it became apparent that Charlotte’s potent inside-out attack led by Al Jefferson and Kemba Walker was hamstrung by perimeter guys who either couldn’t shoot (Michael Kidd-Gilchrist) or who were hesitant to do so (Gerald Henderson). MKG’s performance in Game Two was his best as a pro. At just twenty years of age, he pestered the league’s best player on defense and aggressively attacked the rim on offense. With Big Al hurting and the spotlight on, MKG stepped up and showed cynical fans and nervous Charlotte execs that the former number two overall pick might not be a bust after all. Kidd-Gilchrist’s all-world defensive abilities and untapped offense potential make him the odds on favorite to remain in teal in purple now that Lance is in the QC. A.) Third guards are rarely mid-range, grinder types. Outside of his excellent off the ball abilities, Hendo often takes forever manufacturing his offense and rarely do those posessions end in threes. Ideally, you want your bench guy to be a gunner – a Jamaal Crawford, Isaiah Thomas, J.R. Smith type who can generate points both in bunches and in a hurry. B.) Charlotte has exactly two of those types of bench scorers already on the roster (Gary Neal, P.J. Hairston) whose games’ are much better suited for the role. D.) There simply aren’t enough minutes to go around. Hendo has averaged north of 32 minutes per game over the past three seasons. A team captain, I find it difficult to believe that Gerald will be ok with taking a DRASTICALLY reduced role in the prime of his career with a potential new contract (he has a player option for next season) on the horizon. E.) Hendo was actively shopped to at least two teams leading up to July’s Draft: Charlotte offered Henderson and the 24th overall pick to Orlando for Arron Afflalo. There was also an unreported, but since confirmed trade (by the Baseline’s own @benweinrib) proposal that would have sent Gerald to the Clippers for the 28th overall pick. Think of it this way, if Hendo was on the verge of being dealt BEFORE the Hornets secured a new starter at SG, then what’s stopping them from doing the same now that they have Lance? This post may as well have been titled “Biyombo and Hendo Trade Scenarios”. I’ve written about What To Do with Biz extensively so go read that first if you feel that his inclusion is misplaced. Either way, Biz and Hendo represent a combination of redundency and value while their salaries combine to fit nicely into several two-for-one swaps. WHY CLEVELAND DOES IT: Once the Kevin Love trade goes down, Cleveland will be desperate for both a starting SG and a center who can play more than fifty games a season. Dion Waiters’ ideal role is as a meaty Jamaal Crawford bench scorer and Hendo slots in nicely as the starter and fourth option. Gerald pads Lebron & K-Love’s assist numbers with cuts to the rim on offense and gives the Cavs at least one guard who gives half a crap on defense. Meanwhile, Biz supplies the flammable Love/Kyrie combo with rim protection and won’t, I repeat, WILL NOT be required to touch the ball…EVER. WHY CHARLOTTE DOES IT: Let’s face it, Varejao is going to get hurt at some point during the year. It’s inevitable. But during those 50-60 games he does play, Anderson will allow Charlotte to do some amazing things with their second string center…like catch the ball, run basic pick and rolls, etc. Beyond that, he’s an expiring contract, thus the Memphis late first rounder as a sweetener. It’s a little help now, a little help in the future for the Hornets – all for two guys who likely aren’t in the team’s long term plans anyway. WHY BROOKLYN DOES IT: The Nets need a legit SG in the worst way. Now that Paul Pierce is gone, Joe Johnson will likely move to small forward full-time and Sergei Karasev isn’t going to cut it as the starter. Bismack gives Brooklyn a third rotation big to backup oft-injured Brook Lopez and even allows the Nets to trade either Lopez or Mason Plumlee for a legit piece at another position down the road. WHY CHARLOTTE DOES IT: This is crazy, right? KG is old, on an expiring contract and has lost about ten steps. There’s also this caveat: Garnett has a no-trade clause and can shoot down any deal. So why would either side agree to this? If you’ve made a major investment in VERY young players, why not give them a role model, a leader and a mentor? Say Lance or P.J. get out of line in practice, with Garnett around, they may think twice. If Kemba, Lance, MKG, Cody Zeller or Noah Vonleh become stars one day, they may look back at their season with KG as a lesson in leadership. This stuff matters. It’s one of the reason San Antonio has been able to build and maintain their culture for so long and one of the reasons Washington went after Pierce. As for Garnett himself: D-Will and Joe Johnson are older, Pierce and Livingston are gone and Blatche is still unsigned. Do you bet the last season of an illustrious career on Brook Lopez’s feet or do you join the best young team in the Eastern Conference? WHY OKC DOES IT: The Thunder have some very young wing talent on the roster in Jeremy Lamb and they just signed Anthony Morrow as a floor spacing rotation guy. But do you really want either of those guys playing meaningful Playoff minutes? Defensively, Gerald is better than both of those guys and while he might lack the raw offensive upside as Lamb, his pro game is much further along. A Hendo/Reggie Jackson/Russell Westbrook three guard rotation with a little Morrow mixed in is solid. Also: we get to hear an exasperated Biyombo and Ibaka duo explain that there are “two Congos” for an entire season. WHY CHARLOTTE DOES IT: Perk catches a ton of flack and he’s nearly the turnover machine that Biz has been over the past couple of seasons. But he’s a tough as nails veteran big who can neutralize opposing bigs. Kendrick may not be flashy but he knows NBA defense. Clifford will love having him back there. Roberson’s an intriguing combo forward who played well in the D-League last season. He’s on a cheap rookie deal and is some nice insurance should Jeff Taylor’s recovery stagnate or if Taylor bolts via free agency next summer. The pick would be a highly protected first. NOTE: Free agents signed during the summer can’t be traded until December 15th, so this one would have to happen mid-season. WHY MIAMI DOES IT: Unless they want to go VERY small with two PGs when Dwyane Wade misses time, the Heat will need to add some quality wing depth and who better than Wade-lite? An iso, post-up, volume-scoring mid-range doppelganger who could slide right into the starting five during Wade’s sabbaticals, Hendo is just what the doctor ordered for a Miami team that’s in no position to tank (they owe their first round pick to the Cavs). Meanwhile, McRoberts and Chris Bosh are similar players who likely won’t play all that much together, especially with Udonis Haslem and Chris Andersen back in the fold. And with Lebron’s July surprise, both Josh and the Heat may decide that this wasn’t a great idea for a variety of reasons. Author’s Note: This is an important post for me. It’s the type of analysis I would like to bring on a regular basis, combining statistical information with game tape analysis. Any feedback would be appreciated as I try to find my voice in writing and improve with each post. You can send me comments and criticisms on twitter @bradford_NBA or through e-mail at bradfordcoombsNBA@gmail.com. No criticism is too harsh. Thanks for reading and please spread the word. 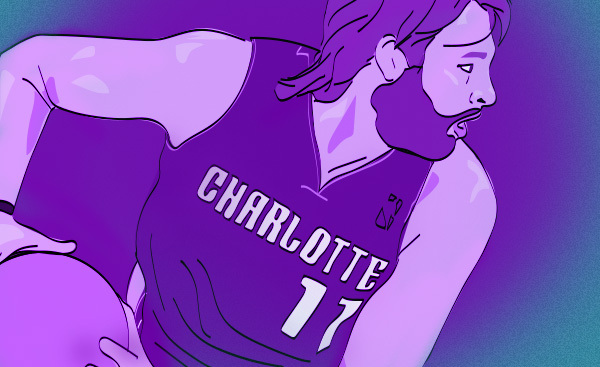 Fresh off a rare Playoff appearance and armed with cap space, picks and motivation to improve, Hornets GM Rich Cho started the offseason with an emphatic THUD as starting power forward Josh McRoberts took his unique talents to South Beach. The Heat offered Josh the full mid-level (4 years, $23m) and the Hornets chose not to match the offer. This wasn’t a Lance Stephenson/Indiana situation. Charlotte had nearly $20m in cap space to play with and were nowhere near the tax line. Rich Cho’s hands weren’t tied. He simply decided that: A.) 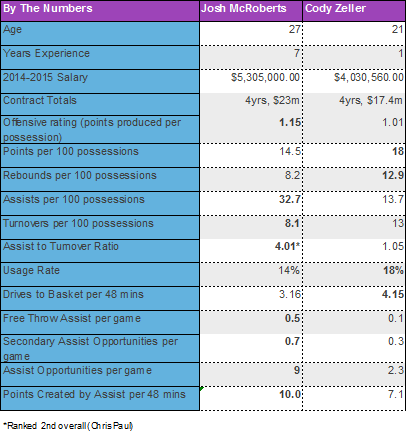 McRoberts wasn’t worth that much money for the Hornets mainly because B.) he believed Josh’s eventual replacement was already on the roster: Cody Zeller, the team’s lottery selection in the 2013 draft. Cho, Coach Clifford, and owner Michael Jordan showered McRoberts with praise over his eighteen month stretch as a Bobcat – with good reason. Josh was a vital piece of Charlotte’s success last season and was often the glue that held an iffy offense together. Will Cho’s gamble pay off? Can Cody replace Josh’s contributions or will this seemingly minor exchange of role players backfire into chaos? It’s worth looking at exactly what McRoberts did to help the offense go and to see how Zeller’s skill-set fits into a similar role. When Zeller replaced McRoberts on the floor he played a similar, though reduced, role in the offense. Clifford had both McRoberts and Zeller play mostly from the outside, involving them in a series of pick-and-pops and dribble hand-offs to get the ball moving from side to side and into the hands of perimeter ball-handlers on the move. McRoberts thrived as a secondary ball-handler on the perimeter. He often initiated the offense at the top of the key and looked to make plays from the outside. His surprising three point shooting was a major plus, both in the points added and space created, but it was his playmaking ability coupled with a low turnover rate1 that made him such an effective role player. Looking beyond the numbers gives us a better understanding of how and why he was so valuable. I watched every2 assist and turnover McRoberts recorded last season. With assists, I tracked what type of action led to the assist and whether it resulted in a three pointer, a mid-range shot, or a lay-up/dunk. The idea was to identify how McRoberts operated within the offense and what types of results his actions were producing beyond just a made shot. I broke the various actions up into dribble hand-offs (including give-and-go’s), drive and kicks, drive and dishes, hitting cutters, direct passes (post entry, swing, stationary teammates), kick-outs from the post, dump-offs in the post, and fast break passes (outlet or on the break). In all, I charted 321 out of 348 assists, including the playoffs. The first thing to look at is the offensive system and what type of actions led to McRoberts’s assists. Looking at this specific set of results strips out some of the stagnation of less involved plays like post-ups and isolations. Clifford’s system clearly called for plenty of ball and player movement with multiple series of actions taking place in a single possession. There were very few plays that didn’t have some kind of dribble hand-off involving McRoberts and they accounted for 18% of his recorded assists. He hit cutters for 73 baskets or 22.7% of his assists. 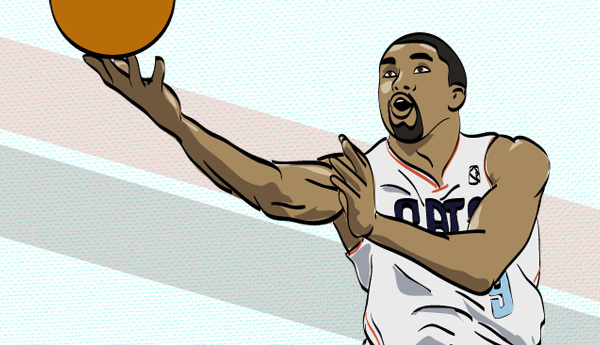 Gerald Henderson in particular stood out as a strong cutter and finisher, very aggressively attacking the rim off the catch, as did Michael Kidd-Gilchrist. Assists on what I defined as direct passes added up to 27.4% of the total. This is an important part of the offense because the majority of these passes were into the post for Jefferson to quickly go to work. McRoberts was a very good post entry passer, having a good feel for where to put the ball and where other defenders were on the court. He wasn’t asked to create out of straight post-ups much, registering only 26 assists on dumps and kick-outs, and those numbers might be a little generous based on my classifications. Finally, Josh assisted on 62 baskets off drives, dumping the ball off 28 times and kicking it out 34 times. He almost always looked to pass on the drive and was a very patient ball handler, never overcommitting or getting out of control. At times his drives were so patient there was hardly a difference between a dribble drive and a post-up. He committed 7 offensive fouls all season and only committed one charge on a relatively questionable call by my eyes. This tendency bears itself out in his shot distribution chart where only 33% of his shots came around the rim. For better or for worse, Josh was always looking to get his teammates involved. One thing that stood out was how simple a lot of these assists were. McRoberts certainly wasn’t short on flair at times, but his greatest attribute in my mind is his court vision and awareness. When paying attention it’s easy to see how active his eyes were when he had the ball, never zeroing in on an individual player, the basket, or the ball. He was much like a quarterback in that regard, going through progressions and reads and looking defenders off. Much like a good quarterback, McRoberts was also able to put the ball in a location that allowed the recipient to immediately make a play. I credited him with 41 turnovers in 82 games due to bad passes and the majority of those were off deflections or miscommunications on cuts. Very few were the result of a poorly placed pass. The key to McRoberts’s effectiveness as a facilitator was his efficiency. His ability to make the right pass to the right player in the right spot made life easier for everyone on the offensive end. As the game and the analysis of the game have evolved efficiency has become a defining attribute of successful basketball teams. People aren’t just interested in the number of points scored, but how those points were scored. Part of that evolution has been determining which types of scoring opportunities lead to a higher success rate. The once bemoaned death of the mid-range game is now recognized as a natural progression towards more efficient basketball. Three-pointers, lay-ups, and free throws are the priority for offenses. The Bobcats weren’t a terribly efficient offensive team, ranking 24th in the league with an offensive rating (points per 100 possessions) of 103.6 per basketball-reference.com. With McRoberts on the floor the team had an offensive rating of 106.2, which would have put them just below the league average of 106.7. When he was off the court, that number dropped to 101.1. Only the 76ers and their abomination of a team had a worse offensive rating than the McRoberts-less Bobcats of last season. While those numbers are dramatic, they likely overstate his value. Turning to ESPN’s real plus-minus metric, which accounts for the value of the other players on the court, McRoberts added .03 points per 100 offensive possessions. For some added perspective, Paul Millsap posted a .04 ORPM (offensive real plus-minus) while David Lee had a -.12 ORPM. I think it’s fair to assume Josh’s true value was somewhere in the middle. He was an important cog in the offense, but not a foundational cornerstone like Al Jefferson (1.31 ORPM, 2nd among centers). McRoberts assists generated 148 layups, 108 mid-range shots, and 65 three pointers. I personally don’t frown on mid-range shots quite as much as some statistically inclined people, but even for me that’s not a great distribution. While the lay-ups are great, ideally some of those mid-range shots would move a couple steps towards or away from the basket. This is mostly a function of how the roster was constructed: Kemba Walker, Gerald Henderson, and Al Jefferson are all mid-range type players. Henderson in particular often takes a dribble in from the three point line when he could just let it fly from deep. Thirty-five of McRoberts’s assists that lead to mid-range shots were of the direct variety. While some of those were post passes to Jefferson, others were the result of players setting up inside the arc. The team would benefit from players extending themselves out to the perimeter as it would improve spacing, something that was almost painful to watch on tape, and create more three point opportunities. The action with the second highest number of mid-range results was dribble hand-offs. These came in the flow of the offense, usually at the elbows. Ball-handlers receiving the hand-off could certainly look to attack more often, rather than settling for so many jumpers. The team could also look to extend those plays out to the three point line, creating more space to drive or to pull up from deep, though it’s possible Steve Clifford wants that action taking place where it does. There is one caveat to all this passing information. Only completed assists have been charted. Looking at SportVU data, teammates converted 54.4% of all assist opportunities generated by McRoberts. That’s actually slightly better than Chris Paul, whose team converted 54% of their opportunities. This provides some confirmation for what the tape showed, that not only did McRoberts find open men but he got them the ball where they had an opportunity to make a play. Additionally, SportVU reported .7 secondary (hockey) assists per game and .5 free-throw assists (passes that led to a shooting foul where the shot was missed and at least 1 free throw was made). These numbers are very similar to Joakim Noah’s, who played a very similar role as a facilitating big for the Bulls, though he did produce 1.7 more points per 48 minutes than McRoberts did. Which brings us to the big question: What will things look like with Zeller manning Josh’s spot and what will he need to improve upon for the team to avoid a regression? First and foremost, Cody should not try to “be” McRoberts. He is a different player, despite having a similar pigmentation and hailing from the same home state. Having watched a lot of Cody Zeller tape, specifically how the offense was run when he replaced McRoberts on the court, it’s clear that Coach Clifford is going to put him in similar spots and expects him to make plays from those spots. Starting with the raw statistics, Zeller averaged 13.7 assists and 13 turnovers per 100 possessions. As a reference point, McRoberts averaged 32.7 assists and 8.1 turnovers per 100 possessions. Both players’ numbers come via stats.nba.com. SportVU data credited Zeller with .1 free-throw assists per game, .3 secondary assists, 2.3 assist opportunities per game, and 7.1 points created by assist per 48 minutes. The disparity in numbers between these two power forwards makes sense when you watch the games: While Zeller played a similar role to McRoberts, receiving the ball in the high post with a charge to pass, attack, or set a screen as a part of a dribble hand-off, it was in a smaller role. Something that stood out in the McRoberts tape was the confidence his teammates had in him. They saw him as a safety valve, looking for him frequently to keep things going. They clearly did not have the same confidence in Zeller, not looking for him as quickly. Zeller was also quicker to move the ball, spending less time surveying the defense to find open cutters. By letting McRoberts walk, the front office is putting their trust in Zeller to have the confidence to look to make plays and be more than just a ball mover on offense. Looking at the same assist categories and distributions as I did with McRoberts reveals a very different type of player. Where 19.3% of McRoberts’s assists were the result of drives to the basket, drives made up 23.5% of Zeller’s assist. Zeller wasn’t nearly as adept at hitting cutters as McRoberts, registering only 7 assists off cuts out of 81 total, or 8.6% to McRoberts’s 22.7%. Part of this is a product of being quicker to move the ball as well as being more aggressive attacking the basket. Additionally, Zeller was more comfortable operating out of the post: 19.8% of his assists came out of the post while McRoberts created 8.1% of his assists out of the post. Zeller’s kick-outs were a valuable way of generating three point attempts. McRoberts aversion to contact as a ball-handler made him steer clear of the post, resulting in only 11 kick-outs for threes overall. In far more limited minutes and opportunities, Cody kicked the ball out of the post for 7 threes. While that’s a tiny number for an entire season, as Zeller’s opportunities and minutes increase those types of plays can be a productive way of generating points. Overall, Zeller had a much healthier distribution of shots on which he assisted. Of 81 assists, 34 led to lay-ups, 28 led to mid-range shots, and 19 led to three point shots. There was a lot to like in Zeller’s playmaking: He was both quicker and more aggressive off the bounce than McRoberts. He was able to get a shoulder past his man and draw help defenders, then find teammates at the basket or on the perimeter. He doesn’t have the flair that McRoberts does, but he often makes the simple, correct pass. His passes also have a zip that McRoberts’s can’t match. In the March 3rd game against Miami, McRoberts threw a nifty cross-court pass along the baseline for a Luke Ridnour three. He used a lot of spin on the ball to get it around the defenders and to his man. In a similar play while facing the Warriors on February 4th, Zeller took a dribble along the baseline then fired a one handed pass over the top to the opposite corner for an Anthony Tolliver three that I had to rewind and watch several times. Thase two plays are a prime example of how McRoberts and Zeller differ in their passing styles. Several times, Cody showed great patience while pivoting. There was no panic as he kept the ball out of reach of defenders and was able to find a teammate for a bucket. For all his turnovers, he was very strong with the ball, not allowing it to get knocked out of his hands by feisty defenders. He used his size to keep the ball out of reach while keeping his eyes up and surveying the floor. Zeller also used his size to make direct passes over the top rather than some of the more crafty ways McRoberts used to get the ball to guys. Cody made good use of ball fakes when passing into the post, keeping both his defender and the post defender guessing. He was particularly effective in dribble hand-offs, using his back-side to create space and prevent his man from getting a hand in to muck up the hand-off. Overall, he set much better screens than McRoberts, who often didn’t make contact with the defender (he seriously hates contact). The foundational elements are there for Zeller to build on and, in time, he should become a solid passer and play-maker for the Hornets. If you’ve ever watched a Draft Express scouting video (you should; they’re superb) you know that feeling of getting really excited about a player while watching their strengths, only to be crushed with the sadness of their weaknesses. Zeller’s short but sweet tape of 81 assists was really encouraging. Immediately following that with 82 turnovers3 was a gut punch and was more in line with my memory of his rookie season. November and December were particularly brutal, as he tallied almost half of his season’s turnovers, 38 out of 82 to be exact. Over those two months, he had 19 bad passes4, 7 mishandles with the ball, 7 offensive fouls, and 5 travels. The deer in the headlights description was completely accurate. Overall, he got whistled for 16 offensive fouls, threw 36 bad passes, some of which were complete head scratchers, including one to a lady on the first row and another on an inbounds play after a made basket, traveled 11 times, mishandled the ball 17 times, and even got called for 3 seconds twice. He was often indecisive and out of control, driving to the basket and jumping in the air with no plan to shoot or pass. There were times it was clear he didn’t know where his teammates were going to be. He lacked the necessary court awareness, failing to see secondary defenders or throwing the ball into crowds. On drives he had poor balance, getting his shoulders well ahead of his legs and trying to complete plays around defenders rather than going through them. While there are valid concerns about how the Hornets will fill the void left by McRoberts’s departure and in particular how Zeller fits that role, Cody has the pieces to do a lot of what McRoberts did so well while using his own unique skill-set. He will need to improve his upper-body and core strength, something he has talked about before. A stronger core will help him maintain his balance and leverage his speed with the ball while better upper-body strength will enable him to go through defenders at the basket and finish for himself or find an open teammate. A stronger approach to attacking the basket will also result in more fouls drawn and less travels and desperate heaves. He could benefit from eliminating spin moves off the dribble from his repertoire altogether. His aggressiveness with the ball is a valuable trait, as he averaged 4.15 drives per 48 minutes while McRoberts averaged 3.16 drives per 48, as calculated using SportVU data. That aggressiveness also shows itself in Zeller’s higher usage rate of 18.2% as compared to 13.8%. One thing Cody could learn from McRoberts is to have patience on his drives. If he learns to slow down at times, rather than barreling into the teeth of the defense, he will be able to create more opportunities for others as defenders collapse. His most important path to improvement is gaining experience. It took a while for the game to slow down for him, and when the playoffs came around it seemed to be back to square one. He will need to learn how to read defenses, account for the speed and length of NBA athletes, operate and know where other players are within the offense, and finish without getting blocked. That seems like a lot to improve but it should come with experience. Cody has a chance to be every bit as good an overall offensive player as McRoberts, and a better scorer and defender. When McRoberts agreed to his deal with Miami, it was assumed Zeller would just take over his role, including the starting position and starter’s minutes. Not long into the official start of free agency, the Hornets went out and signed another power forward in Marvin Williams. He had similar shooting numbers to McRoberts, a low turnover rate, was a better rebounder, but isn’t nearly the passer McRoberts is (or Zeller for that matter). Expect Williams to be the starter and Zeller to play essentially the same role as last season, at least to start. While the idea of contending vs rebuilding/tanking is an oversimplification, it is true that Coach Clifford and the Hornets are looking to build on the success of last season. Guys like Zeller, Noah Vonleh, and PJ Hairston will have their opportunities. Clifford knows the importance of player development, but not at the cost of winning. While everyone expects Zeller to be improved from his rookie season, he’s going to have to earn his opportunities and minutes. I predict he starts the season coming off the bench for around 20 minutes per game, just as he was at the end of last season. I would guess that the organization is hoping he will take over the starting spot by the All-Star break. While Vonleh is several years away from being ready to really contribute, the clock is ticking for Cody Zeller. If he doesn’t make strides, both as a shooter and a playmaker, the team may start looking at Vonleh sooner, rather than later. 1. 8.1 turnovers per 100 possessions and an assist-to-turnover ratio of 4.01 that ranked 2nd in the league behind only Chris Paul. 2. Videos are available at nba.com/stats. Some of the videos don’t really match up to what they’re supposed to so really I watched a video that was supposed to be every assist. A couple games were marked wrong, but the vast majority were right over the season. 3. The real numbers are 94 assists to 89 turnovers including playoffs but footnote 2 still applies. 4. Playing with the bench unit for most of the season didn’t help. I counted 5 interior passes to Bismack Biyombo that should have led to dunks but resulted in turnovers. 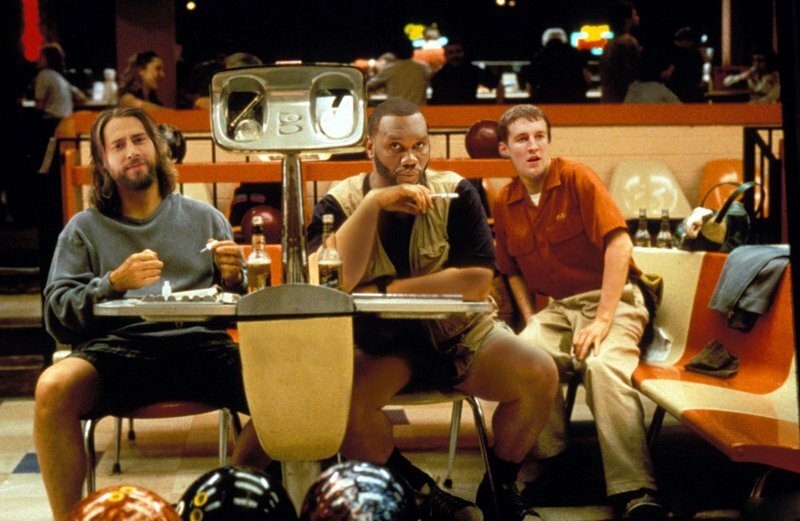 VERY SPECIAL THANKS to Timmy Hoskins for “The Dude” artwork. It is FANtastic. Josh McRoberts has agreed to join the Miami Heat and a tear forms in the eye of every Hornets fan. After being misused at Duke (Coach K misusing a big? No way!) and wandering the league in various states of hair growth, Steve Clifford finally unlocked the McBeast that had been lurking all along. By moving him to the perimeter, Clifford allowed McRoberts to take advantage of his play-making skills, facilitating the offense and being just productive enough as a shooter to keep the defense honest. By almost every metric (plus/minus, RPM, WARP, EWA) McRoberts was one of the most productive and important players on the team. Losing him hurts. But there’s no value in dwelling on the past, so it’s worth looking at how this affects the team for the upcoming season. We’ll approach it on a mostly individual basis. It should be noted these are just my opinions and don’t reflect any sort of insider knowledge. For whatever reason Rich Cho and Steve Clifford won’t return my phone calls and I was recently delivered a strange piece of mail that says something about a restraining order and being within 100 yards of either of them. I need to figure that out… (none of that is true, except that these are just the opinions of an uniformed nobody). Cho is all in on the young players. He easily could have outspent Miami to retain McRoberts. This is pure speculation, but it seems a player option on the 4th year rather than something like a team option or a partial guarantee was the sticking point. Cody Zeller has 3 years left on his rookie contract after which he’ll be getting a raise on his salary. Kemba Walker has one more year and MKG has 2. Cho’s specialty is managing the cap and failing to meet Miami’s offer is, in all likelihood, a matter of doing that aand preparing for extensions to kick in. This is the first real gamble of Cho’s tenure. Betting on Biz, Kemba, MKG, and Zeller in the draft wasn’t making a bad team worse if they didn’t work out. Losing an essential member of a playoff team for the sake of future financial flexibility, just as the team is gaining momentum, is a bold and potentially dangerous move. If the young guys turn out to be what he hopes and the flexibility gives him a chance to make a move down the line he comes out looking great. If the picks are all busts and the team takes a massive step backwards his job might be on the line. 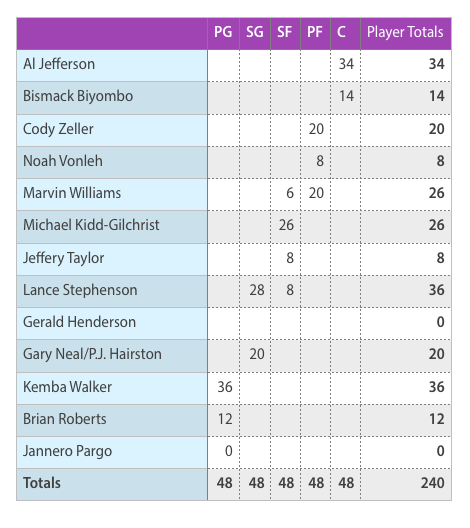 Cho will also need to find a 5th big to go with Zeller, Vonleh, Jefferson, and Biyombo. Kris Humphries’s name has popped up and Jeff Adrien is always a welcome addition to the roster. McRoberts was Coach Clifford’s safety blanket. He facilitated the offense, opened up the floor, and allowed Al Jefferson to operate on the block without clogging the lane. He made hustle plays and was always willing to do the dirty work, as LeBron’s throat can attest to. With him moving on, Clifford is going to have to find a way to craft a post heavy offense that lacks elite shooters. He’ll have to find ways to take the burden of creating off solely Kemba’s shoulders. Most importantly, he’s going to need to bring Cody and Noah Vonleh along and make them productive players on offense and defense sooner rather than later. This is an area where Gregg Popovich excels and is part of what sets him apart from other coaches. If Clifford wants to prove himself as one of the elite coaches, this is a time to do it. Zeller will be affected more than anyone else on the team. He seemed to be in line for similar playing time to last year. Clifford started experimenting with playing him and McRoberts together towards the end of the season. He averaged 22.2 minutes per game in April and that looked like it would continue. He will now be forced into the starting lineup, most likely absorbing all of McRoberts’s 30 minutes per game. He should look to stretch himself as a shooter and as a playmaker. Clifford has been very deliberate about how he has brought Cody along, but there is no longer time for that. The first thing he will need to do is cut down on the turnovers. McRoberts turned the ball over 8 times for every 100 possessions. Cody turned it over 13 times per 100 possessions. That number needs to go down. A lot of those turnovers were on destination-less drives to the basket. Hopefully a strengthened core and more experience will help him keep his balance on such drives or he will look for an open teammate more often. The other are for improvement is his shooting. This is an area that almost assuredly will be better. In March and April he shot over 50% from the field as he got more comfortable in his role. The key is to add more range to his shot. With his smaller frame, he is going to have to develop a 3 point shot in order to be effective, especially with Al Jefferson on the team. That development may not come this season, but he does need to start shooting them. The only way to get comfortable in game situations is to do it in game situations. The coaching staff will need to be patient as he adapts to the longer shot and he will need to maintain his confidence even if he struggles some. He doesn’t need to go all Channing Frye this season, but he needs to let it fly when he is open to start the process. Zeller will have to take a step forward for this team to be effective again. The rumors surrounding Vonleh’s drop were centered mostly on the amount of development he required and his work ethic. The Hornets’ players are a hard working group without question, so they will be there to help him stay focused. The lack of NBA preparedness is going to be a much bigger problem, especially now. Steve Clifford is not Larry Brown. He sees the value in young guys and gives them appropriate time while not necessarily hurting the team. Vonleh probably wasn’t going to see a lot of time this year. Somewhere in the 5-10 minute range. That’s now going to be closer to 15-20 as the only legitimate power forward on the bench. Nobody knows what to expect from him. He was billed as a shooter, but his college sample size was tiny. He didn’t dominate at Indiana, but Tom Crean wasn’t doing a lot to help him out there. He can be inattentive and needs to develop a better feel and IQ for the game. For now Clifford will probably expect him to focus on rebounding, defending the basket, and stretching the floor. In all likelihood he won’t be asked to create or facilitate the offense. He probably won’t have any plays run for him outside of the pick and roll where he will be expected to roll hard to the basket. If he can focus on the basics he should be able to be a neutral presence on the floor. That sounds harsh, but for a project big man with limited experience not hurting the team would be a big win. Biz looked dead in the water going into next season. He played only 14 minutes per game this past season. While he improved significantly overall, his development hasn’t been quite what the team had hoped and management seriously considered not picking up his option. Towards the end of the season Clifford started using Zeller as a center with McRoberts on the floor at the same time rather than going to Biz. Don’t plan on seeing a lot of Zeller and Vonleh on the floor together. Instead, Clifford may choose to do what he was doing with McRoberts, subbing him out relatively early and letting him stabilize the bench unit. Biz’s responsibilities won’t change. He will still expected to rebound and defend and to try to stay out of the way on offense. This may be his last chance. He needs to take advantage of it. With McRoberts gone, the wings are going to have the ball in their hands more with an opportunity to create for themselves and others. For Henderson, this means a couple things. The first and most obvious is that he needs to unshackle himself and start shooting the 3 ball. No more taking one dribble in for a mid-range shot. There is a banner up in the Hornets’ practice facility that says, “Quick Decisions: Shoot It, Drive It, Move it.” If anyone needs to take this motto to heart, it’s Henderson. He has a tendency to catch, turn, face, and survey. Then look some more. Look a little more. Then drive to the right baseline and shoot a fade-away jumper. The surveying needs to be done before the ball comes. He should know where guys are on the floor and where the defense is and make a decision. This will keep the defense on their heels and all the team to generate offense out of more than just Jefferson post-ups and Kemba Walker dribble drives. Henderson is not a great passer, with an assist ratio lower than JR Smith and Caption Iso-Joe Johnson, and gets tunnel vision when he gets the ball, another reason he needs to be more decisive on the catch. If the jump shot isn’t there and the lane isn’t open, make the simple pass and get the offense going. MKG’s approach shouldn’t change as much as Henderson’s. He will still be expected to score off cuts and offensive rebounds. His shooting can be addressed elsewhere. 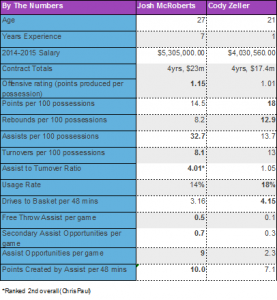 The change MKG will experience is tied to Gerald Henderson. Clifford could look to play more small-ball, moving Henderson to the small forward position and MKG to the power forward position with Jefferson or Zeller at center. Assuming Vonleh doesn’t have much to contribute as a rookie and Biz hasn’t magically replaced his hands with something other than stone cut-outs of hands, going small would be a way to get Jefferson and Zeller rest without a massive drop-off offensively. Clifford didn’t throw small-ball lineups out there at all last season according to 82games.com. He might have to out of necessity this year. Kemba’s adjustment will be simple, but heavy. He will have to accept even more responsibility initiating the offense. Plays often began with Kemba bringing the ball up on the side of the court. McRoberts would cut to the top of the key to receive a pass, Kemba would cut through and get to his spot, and the offense would begin from there. Zeller will do this some, but he’s not nearly the passer McRoberts is yet. Clifford may choose to use more pick and roll to initiate the offense, taking advantage of Zeller’s speed and athleticism and Vonleh’s shooting ability. But it will likely be Kemba’s job to get the offense going more than he did last season. Ideally, Cho would be able to find a backup point guard with the size to play with Kemba to help alleviate some of that pressure but as presently constituted, it’s all Kemba. Similar to other players, Jefferson will need to be more of a play-maker out of his spots. While his passing has improved over his career and his assist ratio was right in line with other back to the basket centers like Brooke Lopez and Dwight Howard, he still has a tendency to attack double and triple teams on the block. He’s successful far more than one would expect but without McRoberts’s shooting and passing Jefferson will have to assume some of those creator responsibilities by recognizing double teams quicker and moving the ball, even if it doesn’t immediately lead to a basket. 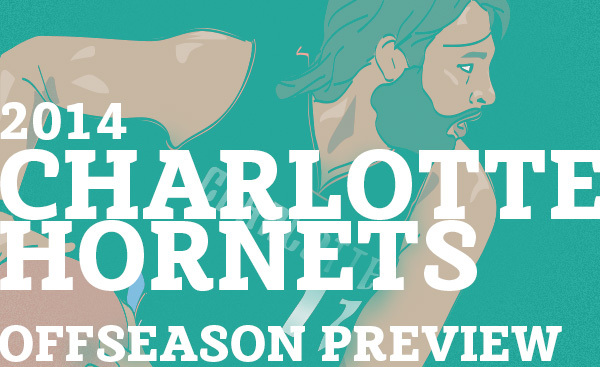 There’s no way around the fact that losing McRoberts is a major blow to the Hornets. He’s a rare player that combines shooting, passing, athleticism, and unselfishness into a productive and essential role player. He can’t be replaced but his responsibilities can be distributed across the remaining pieces. To keep the ball rolling as an organization everyone is going to have to step up and it begins with a clear vision from both Rich Cho and Steve Clifford. Expect a tough start to the season as the players and coach adjust, but with quality leadership from the organization and the players’ ability and willingness to do what is asked of them it should be another successful campaign in Charlotte. BB: The documentary project takes place over a span of years, offering an intimate portrait of CDR’s personal journey back to the NBA. How long have you known CDR and what was your ultimate goal in producing the videos? RB: I met Chris in November 2012 when he first signed with the Texas Legends of the D-League, so I’ve only been part of his journey back to the NBA for the past 14 months. I’ve always had an interest in the behind the scenes aspect of the lives of NBA players and Chris was the first person I approached about creating a web series. At first he seemed hesitant because he really did not know me and he was not where he wanted to be in his career. A few weeks later he had a 49 point game in his D-League debut and since I was video coordinator for the team, I was the only one who had footage of that game. I edited the video and sent to him and posted the link on Twitter. A few hours later it had around 5,000 views. To my surprise, after he was released by the Mavericks he sent me a text and agreed to shoot the web series. The ultimate goal was to tell his story and also show that he was high character guy off the court. Often people may see pro athletes and tattoos and it gives off a negative stereotype. BB: In many ways watching a player like CDR’s journey to the league is much more dramatically interesting than, say, an annointed Lottery pick – those stories are rather straight lines, Chris’s path is filled with lots of twists and turns. Did you have any idea that Chris’s story would play out like it did? RB: Yes. I knew he’d get back to the NBA and I felt like if given the right opportunity he would succeed. The whole web series might have a total different feel to it if he never made it back. I have nothing against playing overseas, but the series was all about his journey back to the NBA. BB: CDR has been praised by the Bobcats for his maturity. Part of that you illustrate through his humbling experiences on the league’s periphery. The doc also introduces us to a young a family man. 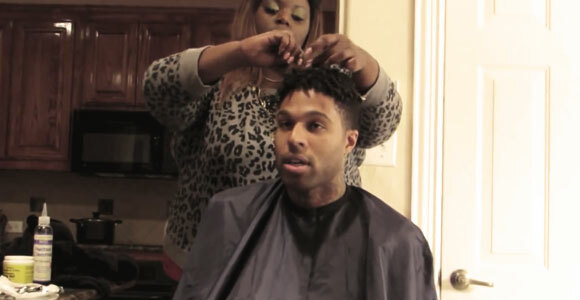 How much of CDR’s success do you think is owed to his personal responsibilities as a father? RB: I think his responsibilities as a father play a huge role in his recent success. Last summer when things were not looking so good he posted a picture of him working out on his Instagram with the caption “If I quit what is Corleone (his son Vito’s nickname) gonna think of me? Anyone who knows Chris knows his kids are his everything. We’d workout until 3am and he’d still get up around 7am to feed his daughter breakfast. 20 years from now, he’ll be able to tell his kids his story about how dedicated he was to his craft and how they benefitted from his hours in the gym. BB: Bobcats fans and the local media keep asking about Chris’s hair but he explicitly answers the question in episode three: “The universe just took me to this”. (Great quote btw) I feel like this could be an alternate title for the series or maybe the name of the sequel. Do you feel CDR’s quest to be different, to be an individual, has translated to his game in any way? RB: I think his game has always been different. Even when I did not know him personally and just watched him at Memphis, I noticed he had an unorthodox game w/ the high dribble, floaters from odd angles and he played like a lefty. He was never considered a ‘shooter’ or a great athlete, but he was known as a scorer because he was so crafty. So the hair just fits into his unique individual style that matches his game and how he dresses off the court. BB: My favorite thing about the series is that it shows us yet again that most non-star pro athletes are just regular dudes with mostly regular lives. 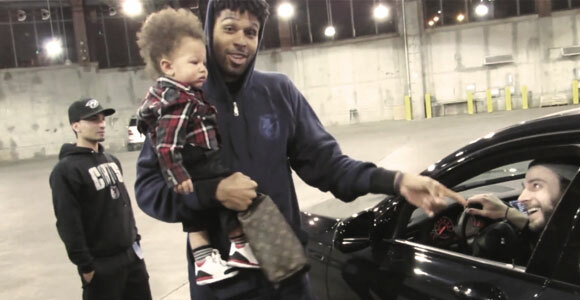 Sure, CDR rolls up to a fast food drive thru in an Italian sports car but he also has to take care of crying babies, go buy diapers, take his girl to The Cheesecake Factory, etc. Was this an explicit intention of yours, to show the everyday, banal side of a pro ballers’ life? RB: Yes. I wanted to show a side of players that nobody sees. Maybe things would be different if he was a mega star like Lebron or Durant and had a max contract with commercials airing all day long. He probably would not be able to go to the store and buy diapers as often as he does. Even to my surprise he lives a very, very normal lifestyle. After games he can be seen loading the kids in the car, going to birthday parties at Chuck E Cheese and watching Yo Gabba Gabba and other kiddie shows on Nickelodeon. 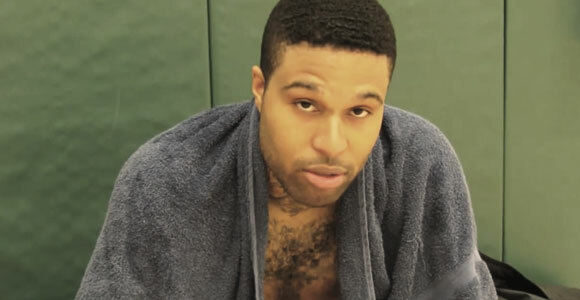 BB: As his trainer, how do you feel about CDR’s vegan diet? He looks noticeably leaner now than a few years ago. Do you think it has helped his game? I personally so not know much about the vegan diet, but he says he can feel the difference and he’s never tired. He looks as if he can play 48 minutes per night at a high level. I do not know if its the diet or what, but it is working and paying off. BB: “Never turn your back on the grind” – basically sums up the theme of the entire series. We see Chris struggling to find his way back to the league early on but his faith in “the grind” – it’s like a mantra – eventually manifests it’s way into Chris’s reality with the Bobcats. Is this common philosophy amongst guys trying to get into the league or is this trait special to CDR? RB: That’s a tough question. I think everyone who’s trying to get in the NBA feels they are grinding and working hard. However, I think what Chris calls “the grind” may be insanity to others. We worked out twice per day for 5 days per week from February through the NBA Summer League. My brother and I kept track of his makes and misses and he’d easily make 200- 250 shots per workout. He’d go home and sit in an ice bucket to prepare for the next midnight session. I’m sure experiencing the NBA lifestyle then going to Europe and D-League added some fuel to his fire, but I do not think you just pick up that type of work ethic along the way. I believe he’s always had a work ethic, he just took it to a totally different level. Even now that he’s back in the league and playing good minutes, he brought me out to Charlotte so we could work on his off days. BB: My fave moment comes in episode 4 where CDR is watching the insane McRoberts behind the back pass and can’t believe a 6’11 guy could make that play, calling it “magical” – hilarious because it was Chris himself who had to finish the play on the other end. What is your favorite moment in the series? RB: I would have to say going to Memphis with him was my favorite moment. I knew he was a big deal in Memphis, but I did not know he could run for mayor. LOL. The minute he walked from the hotel to the FedEx forum the fans were all over him. He probably signed a few hundred autographs and took even more pictures. What I did not capture on the episode was we ran into his old AAU coach from Detroit. He gave me insight on Chris’ background and mentioned how proud he was to see Chris where he is today as person, father and basketball player. BB: It’s been reported that Coach Clifford’s familiarity with CDR is what ultimately landed him in CLT. How did Chris make such an impression on Clifford during last year’s Lakers camp? RB: I did not know Chris at the time, but I’m assuming Coach Clifford saw the same things Kobe Bryant saw during camp. I remember reading reports about Kobe being impressed with his game. Chris has mentioned he felt he was one of the best players in that camp, but for whatever reasons the Lakers chose to go in a different direction. Fortunately for Chris, Coach Clifford took notice. BB: CDR has never shot over 32% from three in an NBA season. He’s flirting with 40% with CLT. Three and D guys are valuable in the league. Can he keep this up? RB: I believe he can stay around the 40% mark. He set a goal to shoot 40% from 3 last summer and he’s very close to achieving it. Lately teams have been closing out hard on him and he’s shooting a lot more contested threes. We go to the gym and put up a couple hundreds 3’s on his off days, so I’d like to think the percentage will increase next season. He made 25 3’s in March compared to only 32 in his previous 4 seasons combined. BB: Bonus Question. How did you become involved with the Texas Legends? I find it an interesting coincidence that CDR arrived via a team now operated by former Bobcat Eduardo Najera. Also, I have to ask, as a Legends guy what are your thoughts on PJ Hairston’s NBA future? RB: I joined the Legends in 2010 as an intern. I had to do a lot of the grunt work and odd jobs like drive the team van and wash laundry to earn respect and trust of the staff. I eventually worked my way up to video coordinator and a basketball operations title. I was not as involved this season as I had been in years past, but I’m still involved in a small capacity and the team has given me the freedom to spend time here in Charlotte. I think PJ has a shot to be a first round pick. He put up good numbers in the D-League and even had some 40 point games. The talent is there and I think where he ends up in the draft will depend how well he handles the interview questions from his Carolina days. Special thanks to @Barlowe500 for the interview. Watch the entire four part series “I Am Not A Star” here.